Heath suffered one of their heaviest ever league defeats when crushed 74-20 away to Yorkshire One’s bottom side North Ribblesdale yesterday. They arrived late at Settle with 16 men - disappointing considering there was no second team game - and came up against a revitalised Ribb side fresh from an away victory over Middlesborough. The hosts, sporting several new faces, took advantage of elementary mistakes by the visitors to go 10-0 up in 10 minutes through a penalty and a converted try. The visitors tried hard to get organised with Ezra Hinchliffe, who started at inside centre, prominent and forwards Andy Piper and Fergus Marsden making strong runs. Heath’s fullback Jacob Storey saved a certain try after 15 minutes but with visiting players all over the place, Ribb scored the simplest of tries to extend their lead to 17-0. Things got even worse for the visitors on the restart when Martyn Barnes was sin binned for a dangerous challenge. Ribb added a penalty for 20-0 but Hinchliffe kicked two for the visitors, the second after Gareth Owen had come on for the injured Si Brown. Heath looked to be turning the corner but Ribb replied with a third try to lead 25-6. As half time approached the hosts thought they had scored their bonus point try in the corner but referee Mike Ramsden ruled it out and blew for half time. Heath re-organised and came out hopeful of stemming the tide, but were quickly undone as Ribb scored their bonus point try on 42 minutes to lead 32-6. Hinchliffe was in no mood to give up and scored under the posts to peg the score back to 32-13 on 48 minutes. Then came the full onslaught by Ribb and Heath capitulated into complete disarray. The hosts scored four tries in 10 minutes to take their points tally up to 60. 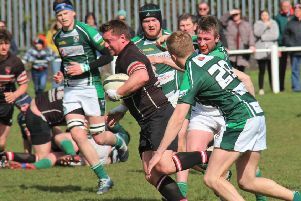 Heath scored a second try through Dominic Walsh, converted by Hinchliffe, but the home team rammed home their advantage with a further two tries. Heath have a free weekend to regroup before a visit from York on February 21.